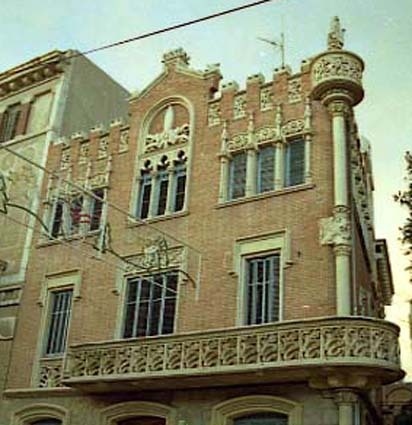 Building projected by Lluís Domènech i Montaner in a style mixing Modernisme (Art Nouveau) and Noucentisme (style following Art Nouveau in Catalonia between 1910 and 1930) and built in 1911. This is a typical building combining the house of owners on upper floors and business warehouses on ground floor. The structure of façades is basically Noucentista with a sober shapes proper of that style, but Art Nouveau is present on façade decoration specially with the use of mosaic and forged ironwork. 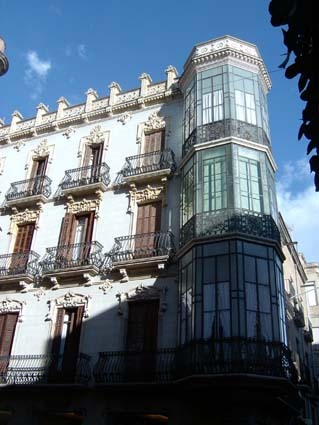 That house is an artwork of the architect Lluís Domènech i Montaner, built in 1900. 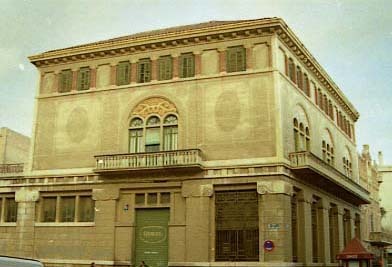 The project of the building was commissioned by the notary Pere Rull i Trilla in a period of big Art Nouveau growth. The façades of that house are an example of brick and stone combination. The angle is specially well solved with a column in stone linking frontal and lateral façades. On the first floor an exceptional balcony with floral decoration on balustrades. Doors and windows of gothic inspiration and embattlements crowning the building give it a very luxurious appearance. 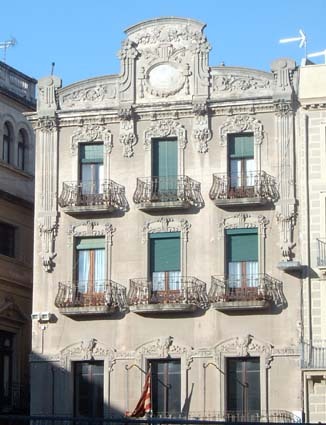 The façades are well conserved, the interior is completely changed from its original decoration and is occupied by the Cultural Action Municipal Institute of Reus. Building designed and built by the architect Pere Domènech Roura in the year 1926. The façade of the Marco House corresponds to an epoch in which the Modernism gave up its vanguard movement position to another tendence, the Noucentisme. Many elements remained, nevertheless, in force in the architecture and this also is noted in the work of Domènech i Roura, son of Domènech i Montaner. Thus therefore in this house the movements in curve are mixed with straight structures like the ones of balconies and windows and that the ones of the corner gallery serving as connection between the two facades. 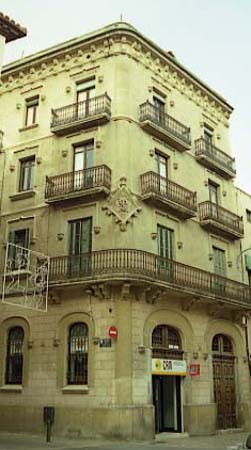 Building projected by the architect Joan Rubió i Bellver and built in 1924. The owner Antoni Serra i Pàmies was a relative of Rubió and he commissioned to him not only that house, but also the rebuilding of a rural residence named “el mas d’en Perdiu” in Botarell (1910), and the Xalet Serra (1912). This house belongs to a period in which the Art Nouveau was in fact progressively substituted by Noucentisme (a style following the Art Nouveau in Catalonia) closer to Anglo-Saxon Art Nouveau tendencies. Nevertheless, some elements as neo-gothic shapes or the embattlements on top are typical of Art Nouveau. The façade is build in stone. The interior is Art Deco. 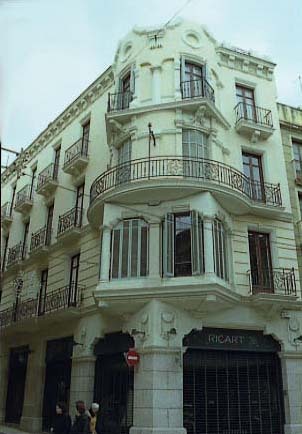 This is a small building projected by the architect Joan Rubió i Bellver in 1926 into the post Modernisme (post Art Nouveau) period. 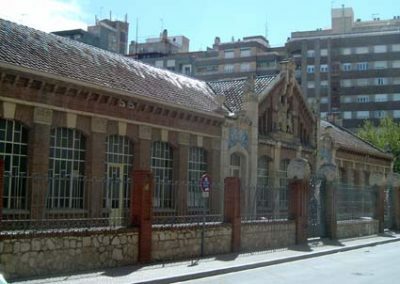 Rubió was commissioned by the Municipality of Reus together with the “Mancomunitat de Catalunya” (the government of Catalonia at that period) to build that sanitary work. Into the big Sant Joan Hospital, that building was in fact an annex for treatment of illnesses related with tuberculosis. That annex show an neoclassic style with stone columns and a stepped roof. Rubió i Bellver was an architect enthusiastic by Art Nouveau, but his last works manifested the influence of Noucentisme (style following Art Nouveau in Catalonia between 1910 and 1930) and this is the case of that building showing an academic influence. Built in 1910 by the architect Pere Caselles i Tarrats. The house is also named Casa del Baró de Llorach due to the fact that the first owner was Miquel Grau Cabré which family owned also in an old past the Llorach castle. This fact is present on the building (llorach is a Catalan word meaning laurel) where the edges represent branches of laurel. Two medallions with the initials of the owner “MG” and the year of construction. All the openings are framed in circular arches with floral decoration, following Belgian Art Nouveau. The building is crowned by the arms of a Greek cross. Building projected and built in the year 1908 by the architect Pere Casellas i Tarrats. 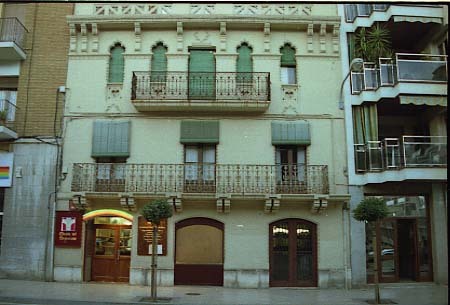 This house is adjacent to the House Navàs. It is a matter of a neighbours house three flats of height and an important width. For this reason, the building has three different entries and naturally three stairs. 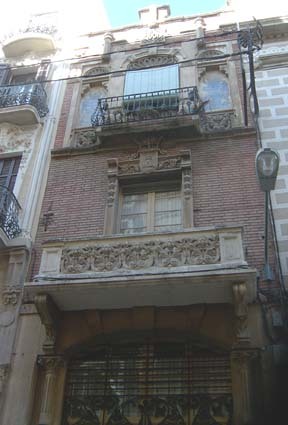 House built in the period of full splendour of the Modernisme (Catalan Art Nouveau), this style is clearly visible in all the façade, showing a decoration with vegetable motives and the decoration in iron forged of the convex banisters of balconies. The entry doors are made in carved wood equipped with iron forged doorknockers of interesting design. Building projected and built in the year 1904 by the architect Pere Casellas i Tarrats. This is a house in a corner with two façades linked by a five-sided gallery starting in the first floor and finishing on the top of the building. This gallery is possibly its more characteristic element. 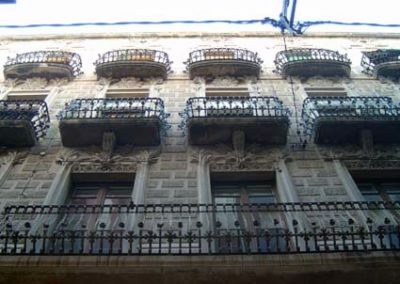 The two facades have plentiful openings with balconies of typical modernista (Catalan Art Nouveau style) style with banisters built in iron forged. The decoration of the doors lintels is varied and bright. The railing of the flat roof is made in stone. On the ground floor, the lintels of the shop windows are very tasteful. Building projected and built in the year 1910 by the architect Pere Casellas i Tarrats. 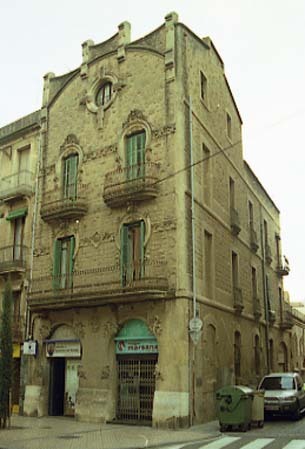 This house shows well clearly the personality of the modernisme (Catalan Art Nouveau style) of Reus with typical floral decorative motives of the city. This house has all the elements of the modernisme. 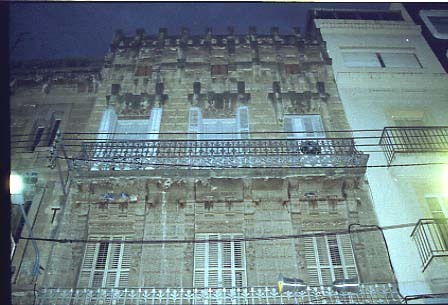 Abroad, a façade profusely decorated, its openings with lintels decorated with vegetable elements and convex balconies of iron forged. To both sides of the façade and from the half of the second floor to the railing of the top, false columns and in the centre false brackets, seem to carry out the flat roof and pediment support. This pediment adorning the top of the building is decorated with a relief’s showing Muses. In the hall the walls are decorated with and a stuccowork show the sinuous lines of the “coup de fouet” so common in the Art Nouveau. Building projected and built in the year 1901 by the architect Pere Casellas i Tarrats. This house carries the name of his owner Ferran de Querol i Bofarull, inheritor of the Bofarull Palace, count of Rius and also related with the Baró de Quadras. He also was the major of Tarragona. It is a small house, but the façade is wealthy decorated with noble materials. 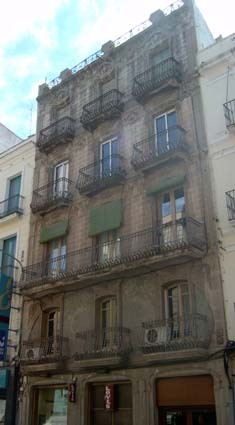 In the first flat a stone balcony is supported by two brackets, being the facade a combination between brick and stone. In the second flat, with a single opening as the first one, the balcony is of iron forged and to each side of the door two ceramic soffits highlighted by the frameworks in sculpted stone are elements of great decorative relief. Built in 1896 by the architect Pere Caselles i Tarrats. 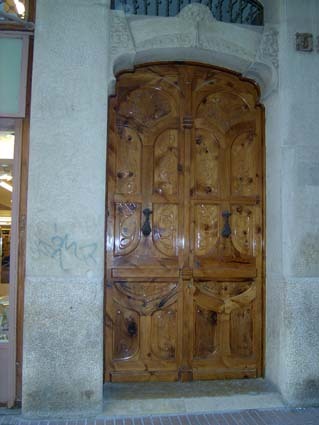 This is an example of primitive Art Nouveau who is present in Reus with various buildings of the same architect (see below). The façade show different elements of gothic and Islamic architecture. The second floor is specially interesting with its stored windows. Both balconies in first and second floor are typically build in forged iron with Art Nouveau shapes. Built in 1909 by the architect Pere Caselles i Tarrats. The ground floor and the mezzanine – with undulating metallic balustrades – have a different design of the three upper floors. This is a house build following the typical floral style of Reus. Some special elements are the woman faces at the ends of first floor balcony. This balcony is decorated with wavy asymmetrical shapes on the balustrade. Built in 1900 by the architect Pere Caselles i Tarrats. 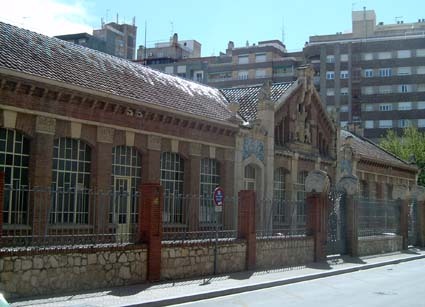 This is an example of first Art Nouveau who is present in Reus with various buildings of the same architect. The building was initially owned by Iglèsias family, instead of the name is due to the presence of a pharmacy named Puyed on ground floor. Neo-gothic façade is perhaps one of the most beautiful of that architect and include a series of grotesque faces on the first floor, likenesses of Christian, Arab and Chinese kings on corbels of third floor and on top various Catalan symbols as the four bars. Arches on ground floor are an example of most typical Art Nouveau. 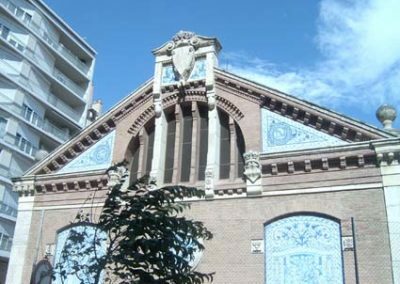 Built in the year 1911 by the architect Pere Caselles i Tarrats, already at the end of the Modernista (Catalan Art Nouveau style) period. The school group is constituted by two bodies of rectangular buildings that are linked by another small body, all it covered with gabled roofs decorated with brilliant green, beige and brown colours. The façades of the buildings, also beautifully decorated, are made in brick and sculpted stone. 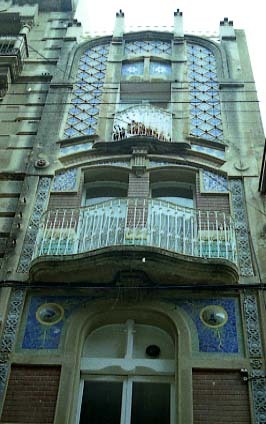 Some parts of the façades are also decorated with four ceramic soffits work of Francesc Labarta. These soffits represent scenes of the Jesus infancy. Other soffits also present decorative themes carried out with Manises ceramics. Pere Casellas had in mind the necessary architectural requirements so that the pedagogical function of these buildings could be developed with the maximum of comfort. By this reason, the buildings are healthy and very luminous, as an example, the spaces reserved to playground, were and follow to be well aired and wooded. As decorative motives, the rose of Reus, the coat of arms of Catalonia and Tarragona and numerous references basically to vegetals. The Prat de la Riba Schools follow hundred years later, assuring the same educational functions. Only the environment has changed and also naturally the interior conditions of the buildings that have had adapted to the modern educational needs. Built in the year 1908 by the architect Pere Caselles i Tarrats, this building is a great quality example of Reus Modernisme (Catalan Art Nouveau). The first floor façade presents a very typical Art Nouveau decoration, different of the upper floors, with great profusion of vegetal decorative motives. To emphasize the stuccoworks with dragons figures in each side of the central balcony. 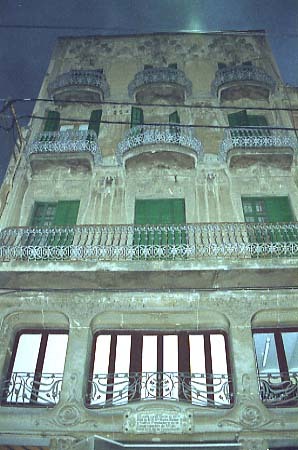 The disposition of the balconies is curious, because on the first floor there are three separated ones, on the second floor it is only one between both façade limits. On the two top floors, the disposition is again like on the first flat. The female figures of the last floor are also interesting. The flat roof banister is combined of iron forged and stone and show typical Art Nouveau drawings. The ground floor also with typically Art Nouveau decoration, is occupied by a store. 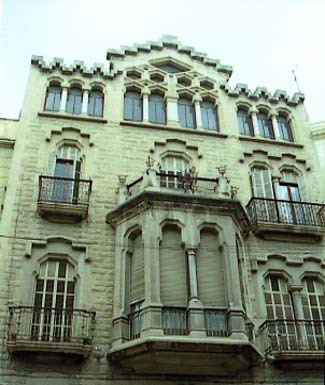 Built by the architect Pere Casellas i Tarrats in 1892, it is one of the first Modernista (Catalan Art Nouveau) houses to be build in Reus and consequently has a lot of neogothic eclectic style elements. The owners Joan and Josep Maria Tarrats i Homdedéu, were at the same time the owners and managers of an important factory called La Fabril Algodonera, also known as the Vapor Nou (The New Steam). They bought the lot of the number 9 of the street when the building of the number 11 was already begun. Because of it, they should be done diverse adaptations with the houses of the main floor, while the upper floors continue being independent. In the angle of the two façades and to the level of the ceiling of the first floor it is found an interesting emblem with the T capital of the owners. Inside the entrance an inscription with the names of the artisans participating in the construction can be seen. 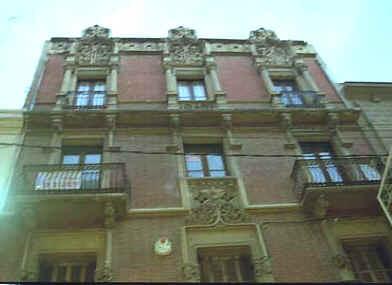 The decoration of the interior is very different according to the houses, the number 11 is vuitcentista style (Style of the XIX century), while that of the numero 9 is modernista (Catalan Art Nouveau. Building projected and built in 1903 by the architect Josep Lubietas on who we don’t have any information. The façade show a series of high relief’s. The ground floor is occupied by a textile shop very well integrated in the façade style. A medieval aspect is pushed by geometric design and a top crowned by embattlements remembering a castle giving a strong personality to the ensemble. 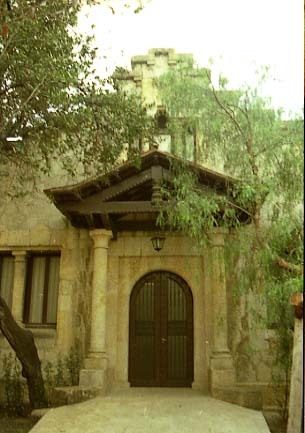 House projected by the architect Pau Monguió i Segura and built in 1904. This is a narrow building with a façade showing a big variety of materials and construction techniques with a special charm. The ornamentation is based in a mixture of geometric and floral motifs showing the introduction of Art Nouveau elements in a building still under eclectic criteria. Ceramic is the basic material together with stone and forged iron for balconies balustrades. The initials of first owner Sixte Laguna appear in two medallions in trencadis (broken ceramic pieces) at each side of the main gate.